Few small cars are as unimpressive as the Nissan Sentra. Though comfortable and roomy, its handling is subpar, the interior is bare, and the base model is extremely slow. Where the NISMO really differentiates itself from the SR Turbo is with the suspension. The NISMO has firmer springs and dampers, and sits just under half an inch lower than its normal sibling. The result is a Sentra that takes turns with much less body roll. But, again thanks to the NISMO’s unique suspension, it has a particularly firm, bordering on harsh, ride. It was bad enough that one of our editors said he would prefer a normal SR Turbo to get that cruising comfort back. The steering is updated as well, and the weight feels fairly nice. Unfortunately, it still lacks feedback, and it isn’t as precise as we would like in a performance car. The Sentra NISMO’s styling is also a mixed bag. On the outside, the little Nissan gets some more visual excitement in the form of more aggressive front and rear bumpers, deep side skirts, a lip spoiler, and new wheels. The lower bodywork features red accents. Don’t worry about clashing colors, though, since the NISMO is only available in white, silver, dark silver, and black. Some of us in the office find the new look to be rather handsome, particularly in the darker hues. However, others find the new side skirts and bumpers add unwanted visual mass to an already tall and slab-sided sedan. Inside, NISMO does what it can to liven up a drab cabin. Faux carbon fiber, NISMO badges, red accents, and suede cover most every surface. The suede is very soft and is found on various surfaces that drivers will touch frequently such as the steering wheel and the nicely padded armrests. Exclusive NISMO seats replace the standard chairs, and they’re improved in almost every way, from the additional bolstering, to the grippy suede and cloth. But those improvements are overshadowed by an overstuffed headrest that can’t be adjusted. This means that it’s constantly pushing on the back of your head unless you lean the seat way back. This editor came back from a few drives with some tired neck muscles. 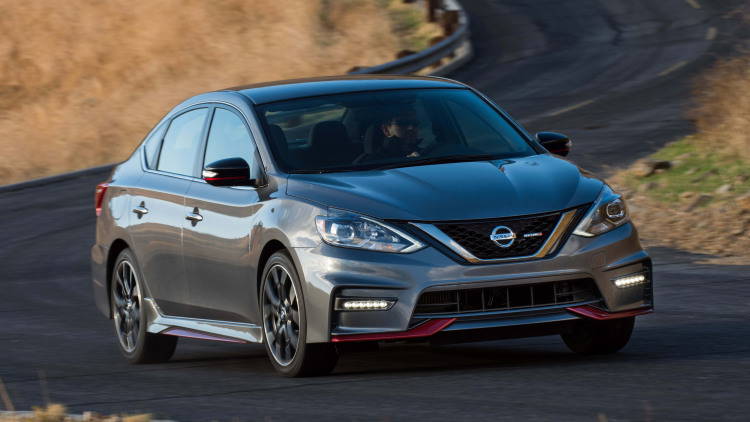 In the end, the Sentra NISMO fails because it’s based on an aging commuter platform that excels only at having space and a relatively comfortable ride, and the NISMO trim doesn’t do enough to overcome those issues inherent to the Sentra platform. It doesn’t add power, and gains in handling sacrifice one of the Sentra’s few strong points. Perhaps if a future Sentra NISMO based on a completely new platform appears, Nissan will have a real competitor. But until then, the current NISMO is too much money for too little car.